You exercise vigorously, especially in high-endurance or performance sports like running, soccer, and bodybuilding. How do you add iron through juice? Tho body doesn't absorb iron from plant sources as efficiently as it does from animal sources. Soluble fiber reduces the absorption of iron. Fresh cold-pressed juice gently removes the soluble fiber, allowing the body to absorb it more effectively. The highest iron content can be found in parsley, basil, mint, carrot, beetroot, broccoli, pears or grapes. Once a week you can juice a raw potato, and in summer you can go for strawberries, apricots, plums, cherries, raspberries, and blueberries. Leafy greens such as spinach contain a lot of iron, but they also contain polyphenols which limit aborption. The solution is to juicce leafy greens with a lemon, which contains citric acid that negates the absorption-blocking properties of polyphenols. What is the best way to juice for iron? Juicing for iron requires a universal juicer that can handle fruits, vegetables, and leafy greens. The best type for this is a horizontal single-auger juicer. This type can handle large quantities of hard roots vegetables without straining, easily processes fruits, and is an expert on herbs and leafy greens. 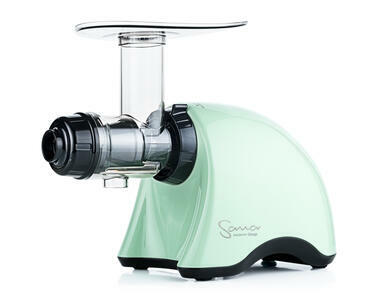 By far our most popular model is the Sana 707 cold-press juicer. With a 5-year warranty on parts and 10 years on the motor, we offer free lifetime service on every Sana 707.